BendPak Lifts – Scissor Lift – SP7-XL – 7,000 lb. Lifting Capacity - Gary Bloom Sales, Inc. The SP-7XL is a brilliant design for full-service auto shops, quick-lube pits and anyone who regularly services vehicles without much room to spare. If you need more overhead space for you and your techs, the full-rise SP-7XL might be the perfect scissor lift for you. A flush-mount option, the SP-7XLF, is also available. The SP-7XL is installed and mounted on your flooring without a cross member. This makes for a true open-center design that provides access to all critical undercarriage areas without requiring operators to awkwardly stoop or crawl across the floor. Reinforced steel at the base and along the top of the runways help provide a stable lift that completely eliminates the need for a cross member or additional structural support. Heavy boxed-steel formed base frame provides excellent stability. Your vehicle should glide smoothly up and down, not rock haphazardly side-to-side. 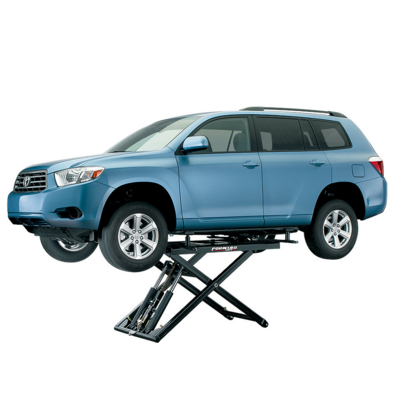 Our sturdy, expanded base guarantees a safe, stable lift. 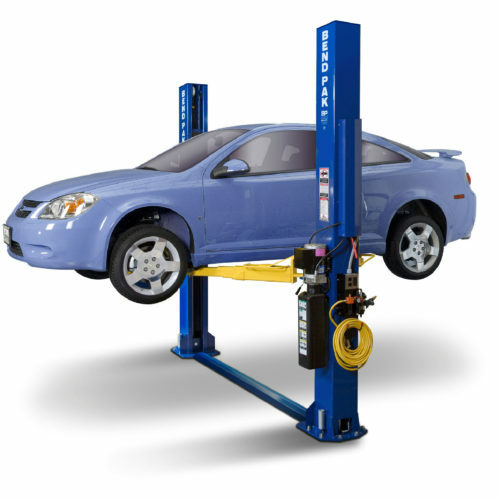 The SP-7XL car lift features two redesigned, extra-large hydraulic cylinders with integrated flow restrictors that control descent, even in the extremely rare instance of a serious hydraulic fluid leak or hose rupture. Two cylinders, one to pressurize each frame, ensure a balanced rise with every lift application. Our “Zerk” grease fittings lubricate essential wear areas, important for keeping the rise and descent action of the lift smooth and safe, as well as preventing damage to the structure of your car lift. Minor weekly and monthly maintenance tasks will keep your scissor lift functioning for years to come. Four robust rubber blocks come standard with each full-rise lift purchase. Since our scissor lifts, like many others, engage the vehicle frame, it’s essential that the contact point is well-constructed. 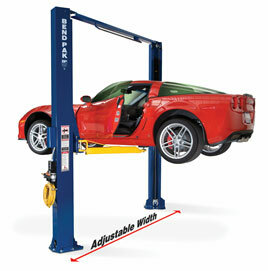 This comes as an after-thought to many car lift manufacturers, but not us. Our blocks are sturdy, thick and textured at the point of contact, so they never slip off the lift point when properly placed. Your full-rise lift comes with graphic safety decals, maintenance decals, vehicle lifting point guide and a safety instruction placard to train personnel on proper safety procedures and maintenance guidelines. Review and familiarize yourself with every safety feature, warning, do’s and don’ts. 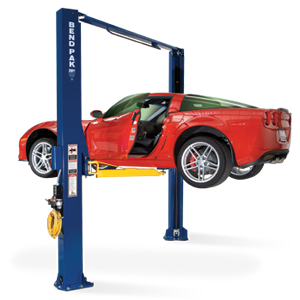 Read the manual in its entirety before installing your car lift or (if you had it professionally installed) attempting to operate it. The SP-7XLF is the flush-mount version of our full-rise scissor lift. If your garage has a recessed area of concrete designed to hold flush-mount lifts, you’ll be pleased by how “invisible” this lift is in your garage. When it’s collapsed, you’re free to drive over it and work around it without tripping on wires or cables. 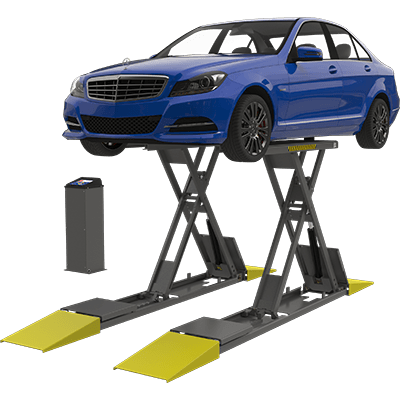 We’re proud that the collapsed SP-7XLF is extremely low-profile, but if you want to take low to virtually zero, the flush-mount version of this model is the perfect car lift solution for your garage.